The royal magician, whose skills are as great as his short temper. Despite his stubbornness, he is loyal and dependable subject, and a friend who will stick with you through thick and thin. Donald was looking for the King Mickey in his throne room, only to find an empty throne and Pluto with a letter containing his seal. Donald panicked and immediately went to find Goofy. After informing him of the crisis, he made Goofy swear to keep it a secret even from the Queen. Ironically, Queen Minnie and Daisy were behind him. The letter contained instructions to Goofy and Donald to find a certain "key" that was essential if they are to survive the coming threat. They were to look for a man named Leon who would serve as their guide. King Mickey also asked to Donald to apologize to the Queen on his behalf. Donald and Goofy flew to Traverse Town accompanied by Pluto and Jiminy Cricket. While looking for Leon, they met a young woman named Aerith who happened to be a friend of Leon's. She told them that she also knew about the King and informed the two of the recent events that have been happening in the different worlds regarding the Heartless, the Keyblade, and a man named Ansem, and how they were connected to the King's disappearance. They were about to meet up with Leon when Yuffie came running from the adjacent room, flattening Donald between the door and the wall, because Heartless suddenly appeared. Donald and Goofy fought the Heartless and ended up at the Third District. An explosion sent them flying and they landed on top of Sora. They knew he was the "key" they were ordered to find when the saw the Keyblade. However, defeating the Heartless in front of them had to be settled first. Once the Guard Armor was taken care of, the three made their introductions and Goofy and Donald explained their quest and invite Sora to join them in their travels to find the King and Sora's friends, Riku and Kairi. Donald wasn't sure about finding Sora's friend, but he managed to convince Sora to cheer up nonetheless and the boy agreed to travel with them. Sora and Donald did not always see eye to eye, and there were many instances when the two clashed, but they became good friends in due time. They encountered many friends and foes alike during their adventures to various worlds, along with several hardships that served to strengthen and deepen their bonds. Their friendship faced the most difficult test when the group arrived at Hollow Bastion, Leon's home world. They found Riku who suddenly revealed himself to be the "true" Keyblade master, and to their surprise, the Keyblade left Sora and came into Riku's possession. Donald and Goofy were forced to leave Sora to follow the Keyblade. However, Sora did not give up and managed to catch up with them and Riku. His old friend attempted to eliminate Sora, but Goofy blocked the attack just in time, declaring that he simply could not betray Sora even though it meant going against the King's orders. Donald believed the same - "all for one, one for all". Finding new strength in their faithfulness as friends, Sora regained the right to hold the Keyblade. They fought with Maleficent and Riku, who was eventually possessed by Ansem. Things were going well until Sora sacrificed himself in order to save Kairi's heart that was residing in his body by stabbing himself with Riku's dark "Keyblade". He turned into a Heartless, but Donald and Goofy could do nothing. They escaped with Kairi, Donald reminding Goofy that they had to get out of the castle alive first. As they were about to reach the exit, a group of Heartless stood in their way. Donald attacked one Heartless with his staff, but Kairi realized it was Sora and with her help he was able to regain his original form. Donald was embarrassed, but thankful just the same. They were able to leave Hollow Bastion and reach Traverse Town safely, but Sora, Donald, and Goofy returned to Hollow Bastion not long after to seal the last Keyhole. The three journeyed on into the End of the World and fought the last battle with Ansem. Ansem lost, but he would not admit defeat and opened the doors to the Realm of Darkness, believing Kingdom Hearts would give him the power to win. He was mistaken, for Kingdom Hearts was light as Sora had declared, and vanished into nothingness. However, the Heartless grew restless and threatened to invade the Realm of Light. The three tried to close the doors, but they could not do it on their own. Just in time, the King arrived wielding the Keyblade of the Realm of Darkness, and with Riku, Donald, and Goofy helping them, he and Sora used their Keyblades to lock the doors on both sides. He comforted Sora, Donald, and Goofy, reminding them that there will always be a door to the light and promised to see each other again before the doors closed. 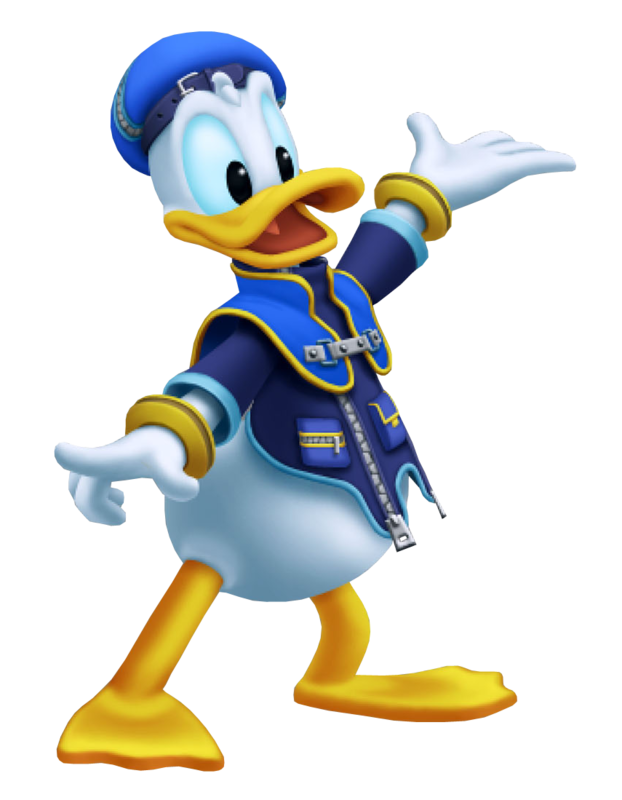 The headstrong but well-meaning court mage of Disney Castle, Donald Duck succeeded in saving the worlds alongside Goofy and Sora in their original adventure. After defeating Ansem at the Door to Kingdom Hearts, he and the rest of the party found themselves at Castle Oblivion, drawn there in search of the King by a mysterious hooded figure. Upon entering, Donald immediately attempts to conjure up a spell to put the enigmatic figure in his place, only to find that he has forgotten every one. As the figure explains, in Castle Oblivion, "to find is to lose and to lose is to find." The moment Donald set foot inside the castle, he forgot every spell he'd ever known. Furious, but unwilling to leave the King in the hands of this enigma and his cohorts, Donald pushes forward with Sora and Goofy, traveling through the worlds of their memories projected onto the castle's floors. However, as Sora grows more and more obsessed with the girl Naminé, Donald and Goofy begin to worry. When the court mage attempts to talk to Sora, he and Goofy are shrugged off and left behind in the eleventh floor hallway. Determined to help Sora and reach the King, the two press on, and end up arriving just in the nick of time as the Organization member Larxene nearly struck Sora down. Reunited, the trio presses on to the thirteenth floor, where they promise to remain courageous in the face of whatever Marluxia - the enigmatic man from before - has in store. When they finally reach the Lord of the Castle, he threatens to use Naminé to destroy Sora's memory - and therefore, his heart. Donald, however, says that even if Sora forgets, he'll help him remember; Goofy quickly follows in suit. The trio holds onto their promise of courage, and defeat Marluxia at last. By that time, however, their memories of the time before the castle were all but vanished, deep inside their hearts. In order to restore them, Donald, along with Sora and Goofy, consent to be put to sleep for Naminé to rebuild what she had torn apart. That sleep ended up taking longer than they had thought; when they finally awoke, it was a year later from when their first adventure began, and the beginning of a whole new story. Court Magician in King Mickey's court, and one of the King's closest friends. When a great calamity threatened every last world, Donald was one of the two Mickey entrusted with the task of finding the Key Bearer of the Realm of Light. Together with Goofy, Donald found Sora and the three managed to live up to the King's expectations and stopped the Darkness. A plot set up by Organization XIII sent Donald along with Sora and Goofy into a yearlong slumber, yet sleeping for that long hardly obscured Donald's vision of his mission - he is still searching for the King who was locked up in the Realm of Darkness, as well as Riku, Sora's childhood friend who went missing with him. Together with Sora and Goofy, the trio remains ever united, and they travel between worlds once more, searching for loved ones and battling beings of Darkness. Donald is faced with a dilemma along their journey, during the great battle in Hollow Bastion. With both the Heartless and the Nobodies assaulting the town, the group is eager to help, only to be stopped by none other than King Mickey himself. He orders the two to take Sora and go look for his friends, Riku and Kairi, who are also missing. Despite the direct order, however, Donald cannot betray his Heart, nor his friendship with Sora, or the people of Hollow Bastion. There's a price to pay for this decision, however, as an explosion sends debris flying from nearby. There is a presumed casualty in the process, and Donald can only stare as Goofy falls to the ground, lifeless. Filled with rage, the magician charges forward, eager to have his revenge for his fallen comrade. It is all for naught, however, as Goofy soon recovers, and while flustered, Donald can only sigh in relief and finally help the others bring an end to the battle. Peace is not restored without a price, however. Sora's usage of the Keyblade apparently helps the Organization, and to top it all, Mickey went missing again. Refusing to give up, however, and with one more dear person to find, Donald leaves Hollow Bastion along with Sora and Goofy, and they continue to travel, bringing peace back to the worlds. They eventually make it to the Organization's stronghold, where everyone they ever searched for is. After a series of harsh battles, victory is finally won over and Donald finds himself on the Destiny Islands, along with everyone else. With peace finally seeming to be more than a far off dream, Donald can let himself return to the Castle to be with Daisy, even if parting from Sora makes him shed a tear. 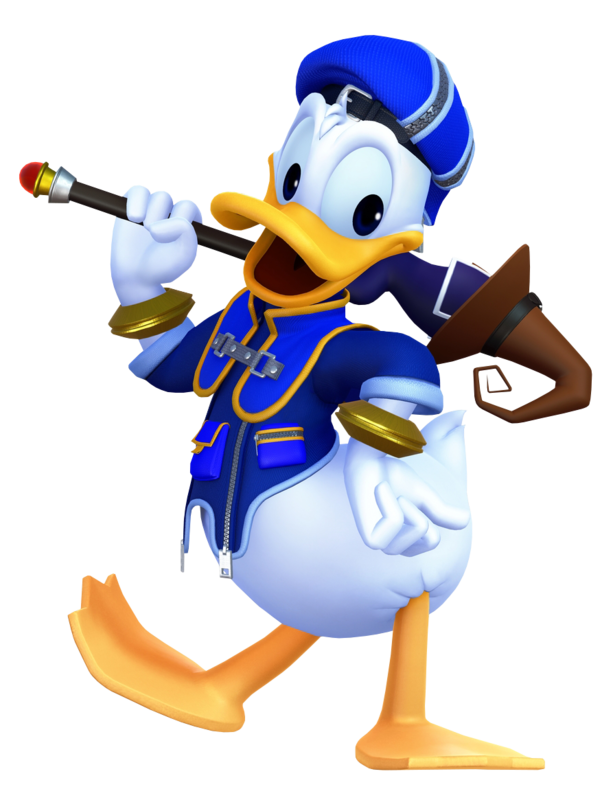 In spite of his state of memory-restorative sleep during the time of the game, Disney Castle's Court Mage, Donald Duck, still makes an appearance as an option in battle. 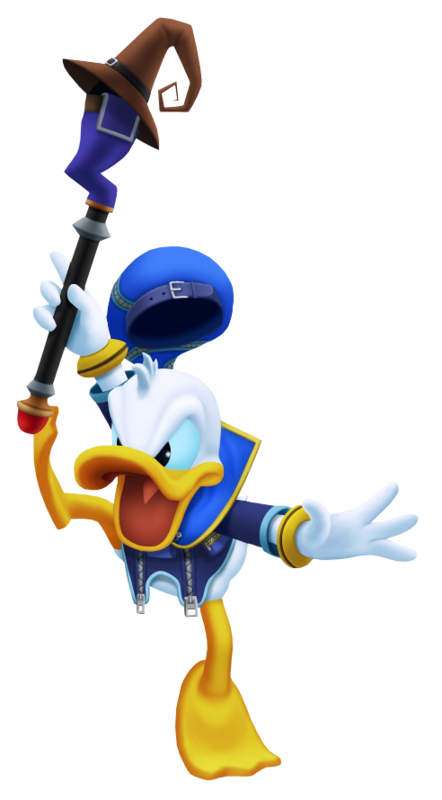 Well-versed in the magical arts, Donald possesses the highest magic power available, and uses it to its full advantage when battling Heartless to great effect. His physical ability, on the other hand, is less than capable, but he is still able to inflict some physical damage with a few well-aimed strikes of his staff. Donald's Limit Break, Fantasia, unleashes the former power on an entirely new level; magical fireworks erupt from Donald's staff, streaking and bursting across the battlefield and incinerating enemies. 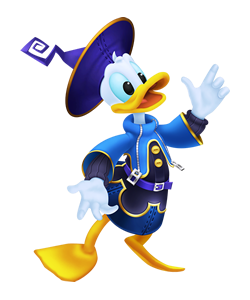 The caring but short-tempered Royal Magician to King Mickey, he and Donald witness and offer support to Mickey during his training under Yen Sid. When Mickey flees with Yen Sid's Star Shard, the magician and Goofy are left dismayed in the Mysterious Tower until the arrival of Ven offers some insight into Mickey's current whereabouts. Donald hands the Star Shard back to Yen Sid, who is then able to use it to establish a link to Mickey and envision his currently-dire situation. Donald is instantly spurred into action after seeing his king in danger, but Yen Sid convinces them to remain behind when Ven decides to rescue the King. Later, as Aqua is approaching the Mysterious Tower, she finds Mickey drifting unconscious between worlds, and she delivers the King back to his loyal followers. As Yen Sid breaks the terrible news of Eraqus' death to Aqua, Donald takes care of the King with Goofy. After Terra, Aqua and Ven's final battle, Donald and Goofy are present to witness Mickey handing back his Star Shard and Keyblade to Yen Sid, but are overjoyed when Yen Sid soon after returns the weapon to Mickey. Court mage at Disney Castle and longtime friend of Goofy and the King, Donald Duck is a bit more aggressive than the rest of the Disney crew, to phrase it mildly. His fierce and headstrong temper, balanced only by the happy-go-lucky pacifism of Goofy, is infamous for landing him in trouble. 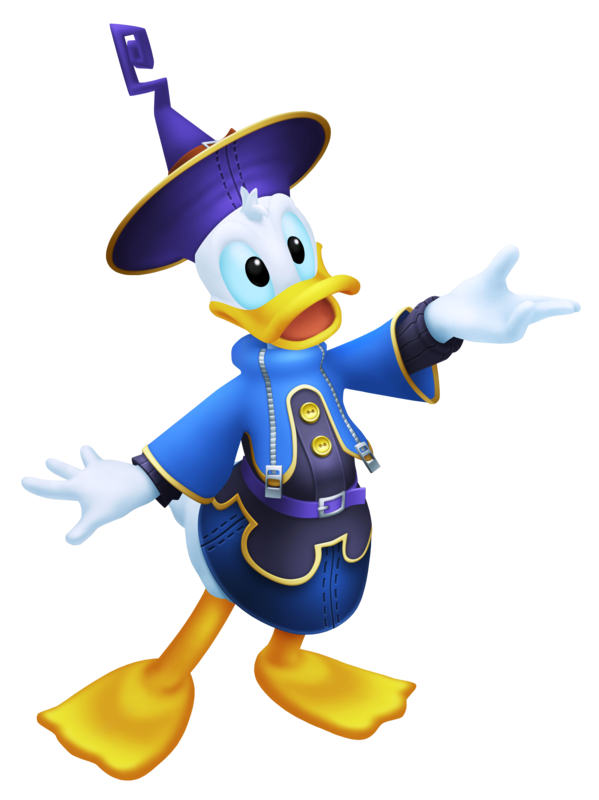 Nonetheless, Donald is good-intentioned, strong of heart, and adept at many powerful spells, which he has used twice before in saving the world alongside Sora and Goofy. He, along with Goofy and King Mickey, was drawn into the data worlds unknowingly while he and the others were monitoring Data Sora's progress. Within the digital Hollow Bastion, he uses his magical prowess to assist Data Sora in fending off the Bugs and the Heartless. In spite of the fact that Data Sora isn't the true Sora (not to mention his own skepticism), Donald is steadfast in defending him against the threats of the journal worlds. The court wizard of Disney Castle, Donald's most pronounced attribute is easily his temper. Always quick to get riled up, he's the perfect person for a position that requires him to cast spells in rapid-fire succession against the never-ending onslaught of Heartless, Nobodies and what-have-you. Donald, along with Goofy, had gone along with King Mickey to Mysterious Tower at support during Sora and Riku's Mark of Mastery exam. Although he plays only the role of a spectator, he itches to get into the action and help out in any way he can, rather than be left to watch helplessly as the danger unfolds. However, he received the chance he so desired when Maleficent's pet raven Diablo appeared with a message for the King, alerting them that she and Pete had taken advantage of their absence to ambush the Queen and take her hostage. He kept his staff drawn, ready to cast a spell within his arsenal that might work to their advantage. He watched and listened with wide eyes as the mistress of darkness revealed her desire for Jiminy's digitized journal, the very one she had almost been trapped in not too long ago, and her involvement with Master Xehanort. Whilst she still had the upper hand, she fired a blast of her signature green flames towards the vulnerable king and his friends, only to be stopped when a red and silver chakram burst out of a Dark Corridor, allowing Mickey, Donald and Goofy to turn the tide of battle. Maleficent and Pete of course, escaped, but no doubt they would all meet again. She's not the type to give up so easily after all. The party then returned to the Mysterious Tower with Lea, who had saved them from Maleficent's tyranny. If they were to ensure Sora and Riku's safety, they would need his help. When they learned just what was brewing in the midst of the Mark of Mastery exam, Donald wanted so greatly to help the cause, but he solemnly agreed with the King's wishes to stay behind in case they failed. If that were to happen, Donald and Goofy would have to defend the Realm of Light in their stead, which was the last thing he ever wanted to do. Donald would not lose his friends, and once again, he and Goofy defied Mickey and burst into the scene with that all-too-familiar Star Shard ─ the very same one he had used over a decade ago when he ironically had gone against Master Yen Sid. Thanks to their sudden arrival, they were able to save Mickey and Riku from Xehanort's grasp and stall long enough for the danger to faze out, allowing them to return to the tower safely, or so they thought. Once there, Donald watched sadly as Sora continued to sleep, his heart having fallen into the depths of darkness and consumed by nightmares, although he didn't show it physically. As badly as he wanted to just shake Sora and wake him up like he used to during their journey, he had no choice but to stay back and allow Riku to dive back into Sora's heart to wake him up from the inside. True to his word, Riku was able to return with Sora unscathed, the latter prior to the former, as Riku woke up from his slumber frankly confused beyond belief as he watched Sora having a tea party with Donald and Goofy. With all the chaos over, Riku declared the new Keyblade Master and left on his first assignment, Lea having finally been able to summon his Keyblade to everyone's surprise, and both his and Sora's departure, that left Donald and Goofy at the Mysterious Tower with just Mickey and Yen Sid. They sat on the steps outside the tower, waiting impatiently for everyone's return and wondering if they'll ever receive the chance to play their parts. Their waiting was halted when Riku returned from his errand with the guest Yen Sid had requested. To their surprise, it was none other than Kairi! But why exactly had she been summoned to the tower? Donald would find out soon enough. The Court Magician entrusted by King Mickey to find the 'Key' alongside the Captain of the Guard, Goofy. After helping save Sora from the clutches of Xehanort, he waits in Yen Sid's Tower for his friend to return from the Sleeping Worlds. With Sora's eventual return to the Tower, it is revealed by Yen Sid that Xehanort's attempt to take over Sora's body drained all of his strength. It is now up to Donald and his friends to return to Olympus Coliseum in order for Sora to regain his strength. The Royal Magician of Disney Castle. He, alongside Goofy, were tasked by King Mickey to find a "key" and save the worlds. After not being able to join Sora on his journey into the Sleeping Worlds, Donald Duck is now back by Sora's side as they attempt to stop the True Organization XIII from succeeding with their plan to create a realm where Light and Darkness exist in equilibrium.